Mount Mercy Academy is a Catholic college-preparatory high school in South Buffalo. Kaleigh Talty of Orchard Park, currently a student at Orchard Park Middle School, earned the Mount Mercy Academy Alumnae Academic Scholarship which is a full four-year tuition that is awarded to the student who scores the highest on the Catholic High School Entrance Exam. Sophia Nasca of Eden, a student at Eden Middle School, will receive the Mount Mercy Academy President’s Academic Scholarship. Nasca will receive a four-year half-tuition scholarship for earning the second highest score on the Catholic High School Entrance Exam. The Mount Mercy Academy Principal’s Academic Scholarship, a four-year, $2,000 scholarship, is granted to Alexis Garmong and Alie Reid. Garmong is a Blasdell resident who attends Frontier Middle School and Reid is from Springville and attends St. Aloysius School. Jillian Schneck of Buffalo received the Catherine McAuley Academic Scholarship, a four-year, $1,000 per year scholarship. She is a student at Notre Dame Academy and a resident of Buffalo. 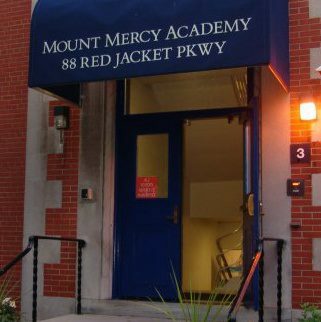 Mount Mercy Academy, a distinctly Catholic college-preparatory high school, is dedicated to educating young women for academic excellence, compassionate service, Christian leadership, global awareness and life-long learning. Rooted in Catherine McAuley’s vision for women and those who are poor, Mount Mercy affirms the uniqueness and dignity of individuals and fosters faith with a commitment to the challenges of building a just society. Be the first to comment on "Mount Mercy Academy announces its 2019 Academic Honors and Scholarships"